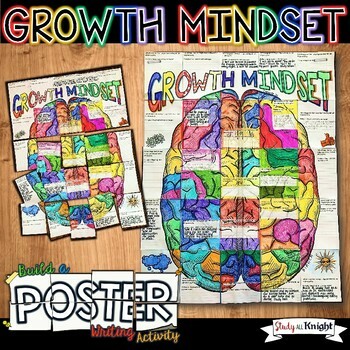 This Growth Mindset collaborative poster is triple the fun with the combination of coloring, creativity, and growth mindset poster group work! All inspired by promoting a Growth Mindset and setting goals in your classroom. The collaborative poster features a goal setting writing prompt and brain friendly fun. Students will collaborate to assemble the poster for your classroom wall, bulletin board, classroom door, hallway, lobby, or library. Great for back to school, test prep and to get your students enthusiastic for striving for the best! Watch students and staff stop and look at your growth mindset poster...it is eye catching! 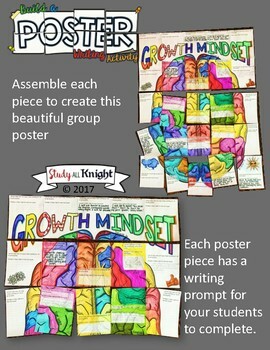 The Growth Mindset poster includes assembly instructions and helpful tips to make it even better! You will only need to print this one time per class! That's it.The collaboration poster project is a perfect size to laminate. You'll love watching your students collaborate. The activity is designed for students to communicate and work together. 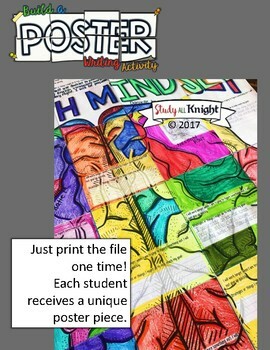 Encourage your students to find class members with poster pieces near their own to create their masterpiece. 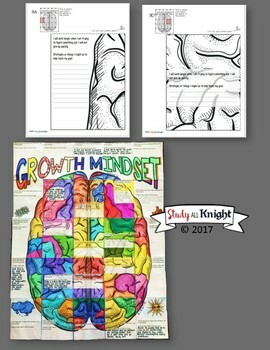 The writing activity is truly insightful and reflective of the promoting a growth mindset, setting goals, learning strategies, and smart goals. ★ A writing activity focusing on goal setting.